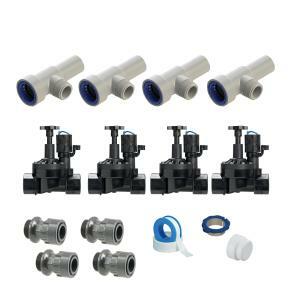 This 4 Zone PVC-Lock Manifold Kit, uses the latest developments in irrigation technology and the easy to assemble design of Hyro-Rain's PVC-Lock system, combined with Hydro-Rain HRV Series Valves using 1” NPT connections. These PVC-Lock manifold kits are designed for ease of assembly and once assembled, are complete and ready for connection to your water system and irrigation lines! Simply connect your controller to the HRV valves, turn the water on to the system, and you are ready to irrigate! The PVC-Lock design does not require the use of toxic glues or primers, just attach the HRV valve, push the fittings together and go. PVC-Lock works in wet and dry conditions, even under water, with instant pressurization, and the fittings will rotate 360° after installation, for easy alignment. In addition with PVC-Lock you’ll leave your project with clean hands and a clear conscience knowing the environment are being protected from harmful chemicals.